Swiggy, India’s biggest food delivery service, is all set to go the Zomato way when it rolls out its new membership program, Swiggy Super later this week. This is one of the strategies in order to grab more customers as it vies for a market share battle with rivals, Uber Eats and Zomato. This kind of a paid subscription service was first started by Zomato which introduced Zomato Treat, a subscription program which provided a free dessert with every meal ordered. Later, they launched the successful Zomato Gold, which extended special perks like complimentary dishes and drinks. Now it’s time for Swiggy to come into the picture with this paid subscription service which offers unlimited free deliveries across all restaurants for its subscribers. 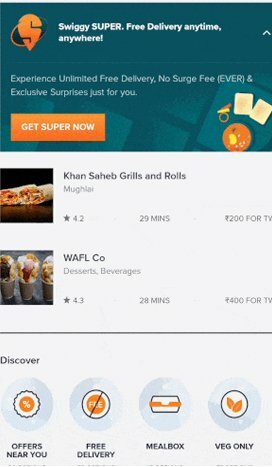 What is Swiggy Super exactly? When you subscribe to Super, you get free deliveries with each and every restaurant, near or far, any time of the day. Even if it’s rain or holidays, there’s no surcharge, ever! You just get to choose your food and ORDER. No surges, no delivery charges! Driving paid subscription is easier for premium customers who wouldn’t mind paying more for convenience and benefits. And a fee as low as Rs.99 is an icing on the cake. 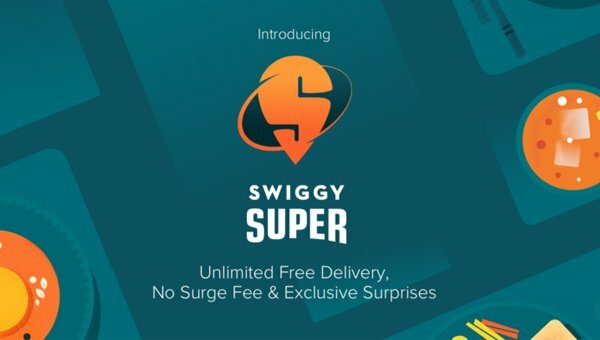 What are the Subscription Plans available for Swiggy Super? You can choose from either the one month or the three-month plan. The monthly subscription will be priced between Rs. 99 to 149 while the quarterly subscription pricing is yet to be ascertained. What are the benefits you can avail right now from Swiggy Super? Watch out for more delightful surprises for SUPER members right here, coming soon. Bengaluru, Chennai, Delhi NCR, Hyderabad, Kolkata, Mumbai & Pune. According to Anuj Rathi, vice-president of product management at Swiggy, Swiggy Super will be rolled out to at least 200,000 loyal customers. 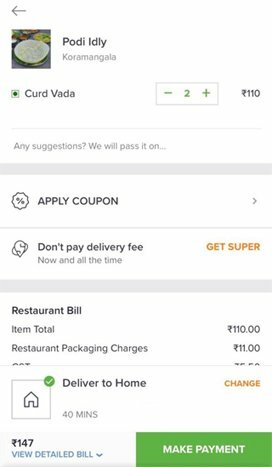 How to subscribe to Swiggy Super? It is reported that in June, Swiggy raises $120 million from investors which have now increased its valuation to over $1 billion. Hence it is now all out to acquire more customers and increase volume orders and this is one of those attempts. Swiggy, which has over 55,000 restaurant partners on its platform looks to pose a serious competition to Zomato in the days to come.